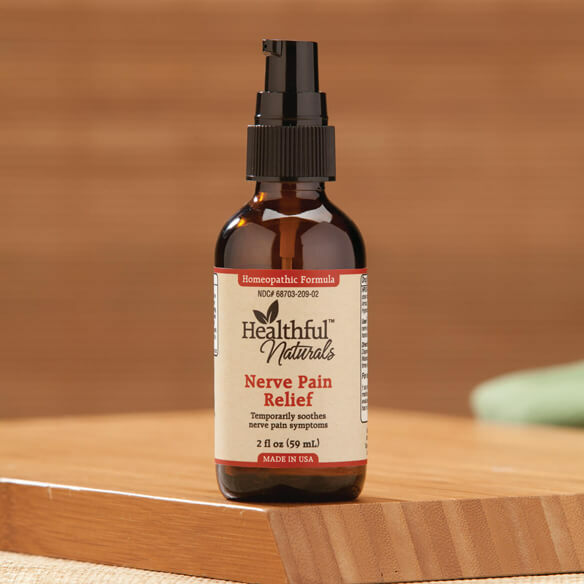 Put your best feet forward with Healthful™ Naturals nerve pain relief. Topical homeopathic remedy naturally soothes symptoms associated with occasional nerve pain, such as tingling and burning in the hands or feet. Ideal for those with poor circulation or nerve damage caused by aging or medical conditions, this natural remedy supports skin health and helps reduce the risk of infection. Active ingredients include arnica, graphites, heloderma, hypericum and rhus tox. Natural grapeseed oil nourishes skin while peppermint, grapefruit, and ginger essential oils cool and soothe. Natural, homeopathic remedy for acute or chronic nerve pain. 100% natural ingredients with a pleasant aroma. Massage a small amount onto affected area 2–3 times daily as needed. Ideal with massage, reflexology, stretching or circulation-boosting activity. Best results when used consistently. Suitable for use on hands or feet, ages 12+. Shake well before using. Dispense a small amount into hands. Massage into affected area 2-3 times daily as needed. I wiuld by this product again. I have been using this product for about 3 months - it is helping nerve pain. I have nerve pain, peripheral nephropathy. Trying to find some help , naturally. I have stabbing pains in my feet and ankles, and I'm diabetic, so I just wanted to see if this item would help. I used it on a friend with ankle pain and she wanted to get some for herself. Trying to find some type of pain reliever for my husbands chronic pain. Have swollen feet with diabetic nerve pain and wanted to try the product for possible relief. Was looking for relief from pain in my feet at night and this product has help. Just ordered my second bottle. I will try this pain relief if its effective. I have painful feet, a friend of mine gave me some and it appears to be working. My husband suggested that I try this. First time user. It sounds like something that might help, wanted to give it a try. A friend also suffering from neuropathy following back surgery recommended it. I can use a product like this. And the price is very reasonable. It was recommended and from reviews. i have numbness on my fingers on my left hand will this product help/? BEST ANSWER: Thank you for your question. Yes this product will work well for you. We hope this information will be of help to you.